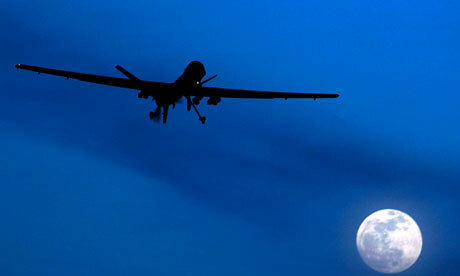 The Guardian> Are drones any more immoral than other weapons of war? Are drones any more immoral than other weapons of war? The use of drones to conduct lethal strikes, particularly by the US and often causing civilian casualties, has come to be one of the most deeply controversial moral issues in the development of modern conflict, driven by the fourfold escalation in the use of drones by President Barack Obama in the global “war on terror” from Pakistan and Afghanistan to Yemen and Somalia. The most recent incident occurred yesterday in northern Pakistan – the first in over a month – when five alleged militants were killed in a drone strike on the compound of a local warlord. So controversial indeed is the subject that last month Congress indicated it was seeking the internal White House memos used to authorise drone strikes where US citizens fighting with militants had been killed. The UK, too, has been drawn in through a court case brought by a Pakistani student demanding to know whether this country has provided intelligence for a suspected US drone strike that killed his father. Paradoxically, it is precisely because of this potential for discrimination, in the context of the execution of the US drone war, that their use has become more morally problematic because it brings us back to the subject of intent, not least in the way in which the US has drawn up its “kill lists” and in its definition of when civilian casualties are acceptable and how those casualties are counted. When Thomas Aquinas condoned killing in self-defence, he defined the moral “doctrine of double effect“, a key concept inJust War theory from Francisco de Vitoria in the 16th century to Michael Walzer in the modern era.